If your like me, you don’t always have the time to make everything from scratch, but you still want it to taste and look like you spent a little time one it. This is a bit of an experiment to add a little something extra to refrigerated cinnamon buns. This definitely makes refrigerated cinnamon buns taste a whole lot better, but nothing compares to anything fresh and homemade! Melt butter in a large sauce pan. Add peaches, brown sugar, vanilla, cinnamon, and caramel. Stir to combine. Simmer for 5 minutes stirring occasionally. Place peach mixture in the bottom of your pan. I used a round 8×8 cake pan. Arrange Pillsbury grands cinnamon rolls on top. Leave a little space in between each bun as they will rise and spread out as they cook. Cook according to package instructions. Let rest 5 minutes. 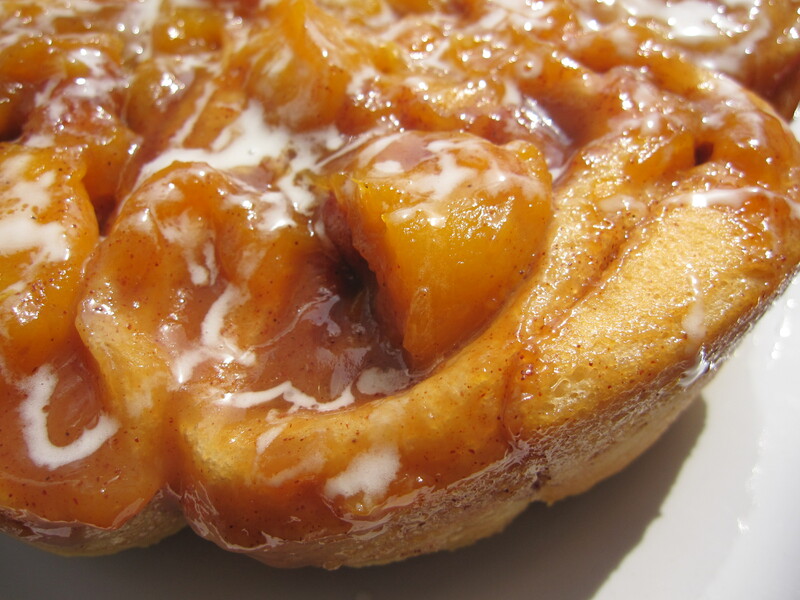 Place a large plate on top of pan and invert sticky buns. If you have a sweet tooth, you can drizzle a little of the icing that comes with the refrigerated buns on top. I thinned it out a little with 2 teaspoons heavy cream and added a 1/4 teaspoon vanilla. Yum! 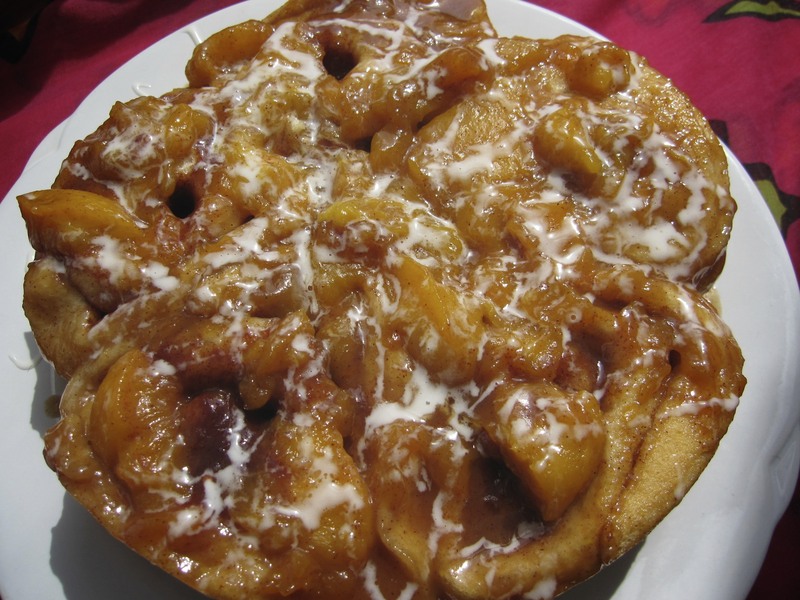 Looks like a funnel cake! Really easy and really delish! I made this for my daughter’s mini birthday celebration (okay, it’s just the five of us, but we still celebrated like there were hundreds of people here) and everyone loved them! My husband doesn’t like cake, and the newly 9-year old has gotten bored with cake & this was a really terrific alternative. Candice is a French wine specialist with a passion for food and travel. She is a graduate of Le Cordon Bleu Paris and recipient of a James Beard Foundation Scholarship. Sharing all things she loves.